IK Multimedia is announced AmpliTube® 4 for Mac and PC is now shipping. Offering exciting new features and gear, it marks a major upgrade to the world's most popular and powerful guitar & bass tone studio: It includes the most advanced speaker cabinet section ever developed, new speaker modelling, 5 new British amplifiers, a new acoustic simulator pedal, a built-in 8-track DAW and a whole lot more. AmpliTube 4 offers more realism, more gear, better sound, more flexibility, more functionality, more tone and just plain more everything than ever before - quite simply, it's the ultimate guitar & bass tone studio ever released. And there are now multiple versions that let musicians tailor their AmpliTube experience for their specific needs. AmpliTube 4 is the major upgrade for existing users of all AmpliTube products as well as new users who want to experience all the cutting-edge features of the latest version of the ultimate guitar and bass tone studio. It comes with 9 amplifiers, 10 stompboxes, 10 cabinets, 29 vintage and modern speaker models, 3 microphones, 2 rack effects and 2 tuners. Players can restore all of their previously purchased gear models using the "restore my gear" feature in the AmpliTube Custom Shop. 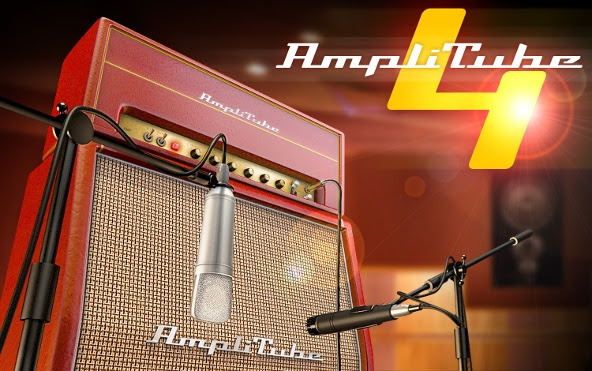 AmpliTube 4 Deluxe takes the standard version of AmpliTube 4 and kicks it up a notch with over 100 pieces of additional gear that includes amplifiers, stompboxes, cabinets and more. This version is perfect for completely new users who want to jumpstart their inspiration with a massive spread of creative processing options to choose from. AmpliTube Custom Shop is the free version of AmpliTube that's a great way to check out the ultimate guitar and bass tone studio. It lets users demo amps from the Custom Shop - all new features and gear are available via Custom Shop purchase. And, for a limited time, in addition to these three versions, users can purchase the AmpliTube 4 + AmpliTube MESA/Boogie® Bundle. This special bundle lets musicians grab the two newest AmpliTube products for one seriously discounted price for a limited time. AmpliTube MESA/Boogie is the official collection of the iconic brand's most popular high-gain dream machines, all in one place. Players get official models of the Mark III, Mark IV, Dual and Triple Rectifiers and the TransAtlantic TA30. If there's one word that defines the upgrades that AmpliTube 4 brings to the table, it's "hyperrealism." It brings together a number of first-of-their-kind features that let users interact with and experience their virtual gear in a way that feels as realistic and natural as having an actual physical piece of gear in the room. The new Cab Room lets users mic their cabinets in a full selectable 3D recording environment with up to two microphones. It's the most realistic and advanced cabinet section ever made. In fact, it's so realistic that users can even customise their cabinets with different individually modelled speakers - AmpliTube 4 comes with 29 vintage and modern speakers to choose from. And they can pick and place different mics to find each speaker's "sweet spot." There's even a mixer that lets musicians mix the levels of their speaker mics, room ambience, direct amp signal and more. AmpliTube 4 comes with 5 classic British amplifier models with matching cabinets that give users access to some of the best British tones of the '70s, '80s and '90s. Each amplifier has been modelled utilising a new-to-AmpliTube technology that precisely replicates the dynamic interaction between the power amp and the speakers. Its new Acoustic Sim pedal lets players easily transform their electric guitar signal into a perfect acoustic guitar sound with the touch of a button. It also comes with UltraTuner, an extremely precise digital tuner and Looper, a 4-track MIDI-controllable recorder/looper that's perfect for sketches, practise and experimental performance. And, for more complex arrangements, AmpliTube 4 now also includes an 8-track DAW with full per-track EQ, pan, level, mute and solo functions. But perhaps what's most exciting about AmpliTube 4 is that these features are just scratching the surface of all the creativity and sonic potential awaiting within. AmpliTube 4 is available now via the IK Online Store and select music instrument retailers for just $/€149.99* or 150 Gear Credits from the AmpliTube Custom Shop. AmpliTube 4 Deluxe is available now for $/€299.99 (or 300 gear credits) from the IK Online Store and Custom Shop, and in the United States it is exclusively available from Sweetwater Sound. And, for a limited time, users can purchase a new bundle that contains AmpliTube 4 and AmpliTube MESA/Boogie® as part of the AmpliTube Power Duo promo for just $/€199.99 (or 200 gear credits) - a savings of $/€100 off the combined retail price. AmpliTube Custom Shop is available as a free download from the IK Multimedia web site.